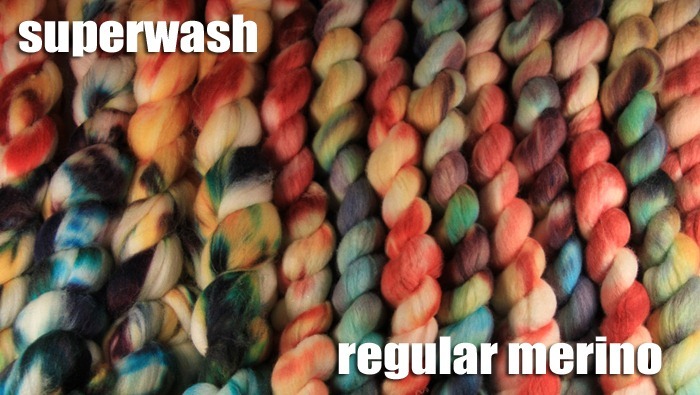 My Fiber Of The Month clubs have really taught me a lot about the dyeing process, due to the fact that I had never before dyed two different types of fiber together in the same bath. My colorways were one of a kind, and I would choose a batch of merino one day, a batch of BFL the next, and a batch of superwash later. Take a look at the fibers in the photo above and notice how different they are. These were dyed on the same day, side by side in the same roaster pan. I don’t know the specifics about the “superwashification” process, but something about it drastically changes the way the fiber soaks up dye. Whereas untreated merino wool on the right has softly blended colors that bleed into each other, the superwash is a combination of bright patches of intense color and naked ecru. The superwash also saturates with water more quickly when dunked, requires less baking time for the colors to set, and will not bleed as much when rinsed afterward. It used to bother me that I was unable to make them identical, but lately I’ve really been embracing the serendipitous outcome. Some months I’ll take special steps to match them more closely. Use more dye and less water on the untreated merino to ensure bright color patches and less bleeding. Conversely, I will water-down the superwash dye to allow the extra liquid to spread dye further throughout the fibers. Then there are months like this one… where I just start pouring dye here and there, and sit back calmly awaiting the results.